Let me open my first contribution to this quarterly column by saying how honored I am to be leading MCA-I New York this year as your chapter president. I look forward to working with our new board of directors: building on the progress we’ve made to date and continuing to bring you opportunities for professional and personal enrichment in the future. 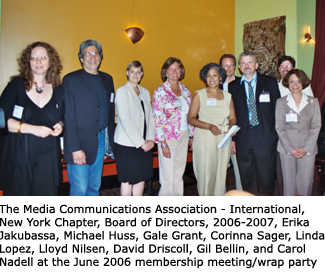 As you may know, MCA-I NY wrapped its programming year on June 14 with a party and membership meeting at East of Eighth in Chelsea. It was a beautiful night and gave us all a chance to unwind and indulge in a little self-congratulation. I think the 2005-2006 season was the best yet in a recent string of winners, thanks to our A-team of dedicated volunteers and sponsors. Those who worked on the Stories from the Field film festival in April know what a challenge it was to pull that off – on the heels of a full season of events, no less. But we did it! We were rewarded with a great festival – double the numbers of last year plus some truly memorable films – and pledges of support for an even better showing in 2007. Oh, yeah, and some of us got to share the reception stage with Sin City villain and festival Honorary Committee member, Benicio Del Toro, who handed out the film awards and caused some major swooning among the guests! In May we held our first chapter election in many years. As a result, we were able to add four new members to the New York board of directors and rotate some of the sitting members. 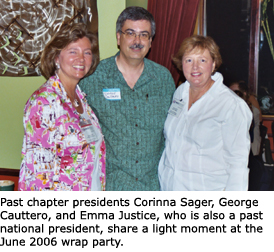 I took the reins from Corinna Sager, who had generously served for four years as chapter president, helping us to realize a number of important goals, both locally and within the larger organization. Fortunately, she will continue to give us the benefit of her expertise as chair of the programs committee. After an amazing twelve years as board secretary, Donna Coney Island rotated off the board to accommodate an increasingly demanding performance schedule and family obligations. We thank her for her years of service and wish her continued success in her career. Former treasurer Dave Driscoll handed the books over to Gil Bellin, but will continue as a director at large. Dave has kept us honest and sensible for four years and we have no doubt Gil, an award-winning producer/director, will do the same. Lloyd Nilsen, one of our film festival powerhouses and very tech savvy, is the new president elect; veteran cameraman Michael Huss and filmmaker Erika Jakubassa are the new directors at large. MCA-I, your parent organization, is always on the lookout for ways to add value to your membership experience. As your representative on its international board of directors, I can tell you we have a wonderful team in office right now, and I am truly proud to be working with them. I got to meet them all in Las Vegas this past April. 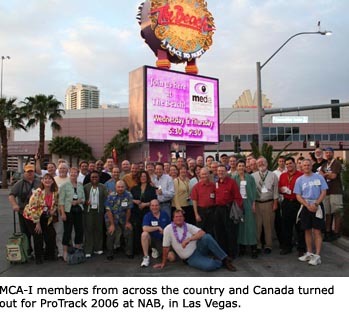 Sixty-plus MCA-I members from around the country traveled there for the annual ProTrack conference, which was held in conjunction with NAB. After a week of conference activities, the board and leadership team had a daylong meeting to plot the course of the organization over the next few years. One big project right now is the newly designed Web site www.mca-i.org. Although it is still being tweaked, it is quite live, so do check it out. The redesign is helping MCA-I members to share information and market themselves more efficiently. 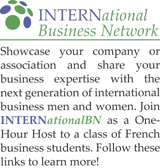 Our international president, Connie Terwilliger, contributed to this issue with a few tips for updating your member listing on the new site. The member directory allows you multiple profiles, links, file uploads, and a number of other cool features. Why not make the most of the opportunity? The new site not only provides a great showcase for your talents, it also places higher in the search engines than the old one, and you know what that means – more hits! One more pitch for the IO: We are trying to gather demographical info on the chapters, so we can attract sponsors and serve you better. Would you please help us out by completing this short survey? It really is short, about two minutes to complete; and we’ll let you know the results when it’s over. Thanks! Your 2006-2007 board won’t be idle this summer. We’ll be working on the upcoming season of events and processing what we learned from this year’s activities and your suggestions. I hope we will see you when we reconvene in September. Meanwhile, there are so many wonderful ways to unwind in New York in the summertime. Try them all and report back to me at the fall kick-off!